Depleting fuel reserves have had manufacturers look at alternatives the world over, for a while now. Electric vehicles though have turned out to be the most feasible of them all, and EVs seem to be gaining popularity, for varied reasons. Admit it or not, the biggest draw of EVs for a very big chunk of buyers today are their extremely low running costs particularly when it comes to two-wheelers. Hero Electric has recently launched the Nyx, a scooter primarily targeted towards short-distance mobility, with the added benefit of ample storage and utility space. But is it good enough to replace a conventional scooter? Putting it through the rigors of commuting helped us answer the question. Read our review on the Hero Electric Cruz here. The Nyx has been designed with a focus on functionality than styling, to offer lots of space. While the front end looks similar to small entry level scooterettes, the long wheelbase makes for a rather unconventional design. The footboard is long and offers ample space, and can easily accommodate a full-size luggage bag. The seat isn’t one piece as we’re used to seeing on scooters, but is a split unit, and the pillion seat can be taken off to stack up luggage behind the rider, which confirms the fact that the Nyx is an electric scooter built to do a lot more than just let you commute with very low running costs. Switchgear quality is good and interestingly, the Nyx gets two horn switches, the other replacing the starter button. The front apron gets a glovebox with an integrated bottle holder, while the under seat storage space provided is good enough only for the scooter's charger and other small objects. The scooter gets corrosion- and UV-resistant paint, and its quality is on par with the other conventional scooters available in the market. Fit-finish levels are good. As a safety feature the NYX gets an MCB unit under the rider's seat, for protection against short circuits. The Hero Nyx has a 250W 'Brushless Direct Current Motor' (BLDC), powered by a 48V, 24Ah battery. Like all electric motors maximum torque is available right from the word go. This translates to quick acceleration from standstill, and the sudden surge of initial torque is something you need to get used to. There is a minor glitch though: every time you accelerate from standstill, you tend to get a jerk, which can get annoying in bumper to bumper traffic. Hero claims a top speed of 25kmph though our VBOX tests revealed it can touch 33kmph with a single person onboard. Inevitably, some planning is required while going up on steep inclines and you need to ensure you are carrying enough momentum, as speeds start dropping. With two people on board on a steep gradient the bike might even stop moving forward, due to which the motor simply cuts off, resulting in the pillion having to walk up the slope instead. The Nyx gets conventional telescopic forks upfront while the rear employs double coil spring units instead of a single damper. This again points towards load haulage, which is the Nyx’s intended job description. Ground clearance is 160mm and even with the long wheelbase and two people astride it doesn't scrape the underbelly. Kerb weight is just 75kg. The Nyx has a conventional riding position that allows it to be ridden with ease. Seat height though is lower compared to other scooters. The long wheelbase allows for a more stable ride, but takes some getting used to while the suspension setup is balanced, and does not feel too soft or stiff. The Nyx isn’t a scooter that one can have fun with around corners – with its long wheelbase and skinny tyres it isn’t too happy being chucked into fast bends. The rear seat can be swiveled forward to be converted into a backrest for the rider, while freeing up space for more luggage. In its normal position though the rear seat rattles consistently which tends to get annoying. None of the other panels on the scooter made any sounds over the course of our tests though. The 10-inch wheels on the Nyx come fitted with drum brakes at both ends and have a progressive bit, similar to other conventional scooters. Hero Electric claims a range of 65km for the Nyx and we were able to eke out 61km on a full charge. My daily commute from home to office and back is 30km and the scooter had just enough charge left to complete one more round trip at the end of the day. You get a 3-point charging connector with the scooter, enabling you to charge it from anywhere. The charging port is located between the rider's seat and the floorboard, and the battery takes over 8 hours for one full charge. Once charged, the charge indicator lamp on the connector box turns green and automatically cuts off supply of current to avoid battery damage. As per our calculations the Nyx consumes close to 1 unit of electricity in an 8-hour charge, which translates to about Rs 5-6 per 60km or 6 paise per km depending upon the electricity unit in your state. Now, with fuel prices at Rs 76 per litre (in Maharashtra), a conventional 110cc scooter will cost around Rs 100 per 60km or Rs 1.66 per km (considering an average fuel efficiency of 42kmpl). If we consider the yearly running to be 10,000km, the Nyx will consume roughly around Rs 600 worth of electricity, compared to Rs 16,666 for a petrol-engined scooter. Hero Electric claims the battery pack is good for approximately 650 charge cycles, which amounts to around 45,000km. However you will have to shell out Rs 22,000 for a replacement battery pack. So the total expenditure at the end of 45,000 kilometres is Rs 24,700, as compared to roughly Rs 75,000 for the same distance covered on a conventional scooter. 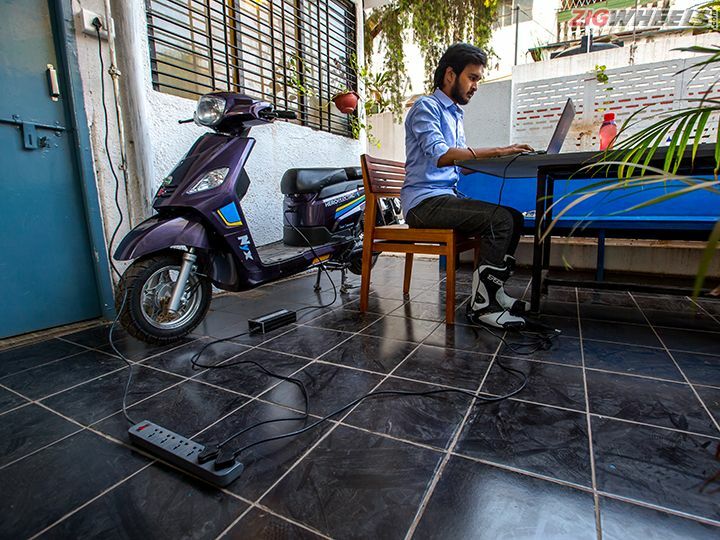 This makes the electric scooter better value for money, with a difference of Rs 50,300 in running costs when compared to a conventional scooter. The Nyx, being an electric scooter, is supposed to help you save money while also helping keep our planet clean. It does not require RTO registration or a driving license either being a non-polluting vehicle which means people from all age groups right from teenagers to senior citizens can ride it without any paperwork. Ownership costs are also downright negligible as compared to conventional scooters. The Hero Electric Nyx is available at Rs 35,690 in Maharashtra. But, even with its low speed and torque and a limited charge range, it still isn't as practical as a conventional scooter. The low running cost of the Nyx is a big plus and a good deal for those who have the need to move around or carry goods over short distances. I can see a market for these scooters in small towns that rely heavily on mopeds as a form of transportation. However, as a personal mobility transport, the Nyx leaves a lot to be desired. Share your experiences with NYX? Confused about Hero Electric NYX?